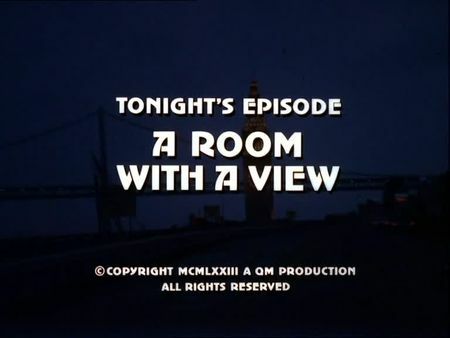 I have uploaded the screencaps for A Room With A View to the episodes' page. This one opens with the murder of a bookmaker's brother, since the actual target, Roy Chaffee, is willing to leave the business and to provide information to the police as his wife is expecting their first baby. Following the murder of his brother, Chaffee quickly skips a secret meeting he had planned with Stone and Keller, and disappears in a hide-out unknown to the police. Our two cops got word that Art Styles, a known hitman of Hoyt Llewelyn - another bookmaker with high aspirations - was set on finding and eliminating Chaffee, so they are staking out the suspected hitman's location. When Llewelyn is found dead in his car in the San Francisco bay - and being unaware of the fact that Chaffee's hide-out is right across the street from Styles' location - Mike and Steve are somehow stuck. After Steve suggests to shadow Chaffee's wife, just in case he would try to see her, they are finally on his trail. The core story of this episode, however, is the relationship between Art Styles and his hostage, Mary Rae Dortmunder - a simple-hearted junior high school teacher, whose apartment serves him as observation spot. In the beginning, Styles is quite making fun of Mary Rae's naivety and her imagination of an idyllic world. Later on, however, her questions and her sympathy are somehow affecting him. Much of this episode takes place in the Mission District. Roy Chaffee's brother was killed in his car on 24th Street, close to Castro Street, and Roy Chaffee's hide-out is located on 933 Church Street, with Mary Rae Dortmunder's apartment right across the street. Stone and Keller are observing Chaffee's wife and their house on Hill Street, close to Sanchez Street. Mary Rae is teaching at Everett Junior High School (today Everett Middle School) which is also located on Church Street, between 16th and 17th Streets. Additional filming locations include the Conservatory of Flowers (where Mike and Steve intended to meet Roy Chaffee in the beginning), the Yacht Harbour on Marina Boulevard (where Hoyt Llewellyn's boat is anchored), and, for the final sequence, San Francisco International Airport. Llewellyn was murdered in the Pier 36 basin, however, several Piers have been demolished in the meantime, and Pier 36 is among these.